This was recorded in Dayton, Ohio, 12-14 October 2001, at the 13th reunion of The 61st Troop Carrier Squadron, WW II—and it all just fell into place in the hospitality room when Lew Johnston and his tape recorder walked into an on-going discussion about the second day of the Airborne Invasion of Holland. This was the ill-fated Market Garden operation at Arnhem, Nijmegen, and Driel. George Merz was talking with several of our members and also with Joe Mize of the 62nd squadron who often comes to the 61st reunions. The conversation was off-the-cuff without preparation or rehearsal. Market Garden was a very ambitious undertaking planned by British Field Marshall Sir Bernard Law Montgomery. It was very complex, and there is still much debate about whether it can be declared an operational success or failure. But there has never been any doubt about the courage and valor of those who participated in it, nor has there ever been any doubt about the courage and dedication of the Dutch people. All of us who took part in this operation look back on it with a large measure of pride. 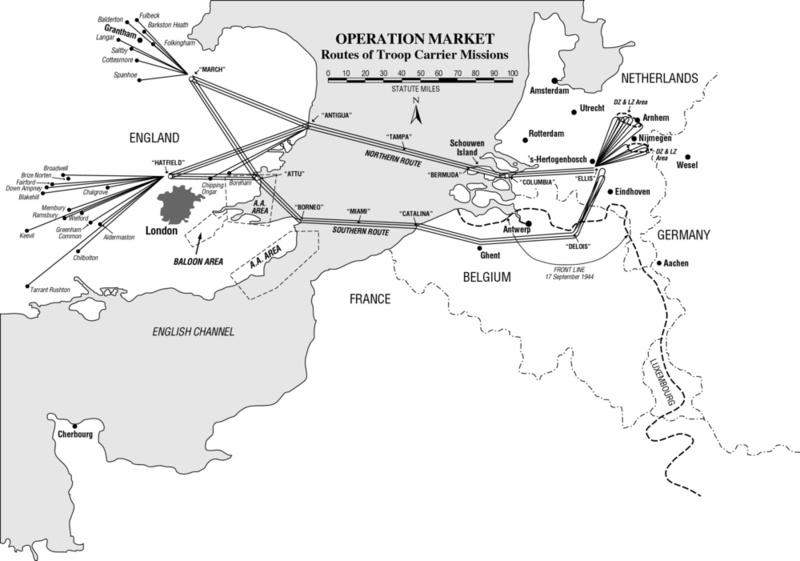 On 18 September 1944, Troop Carrier airplanes (mostly C-47s) rose from the many bases in England and converged on Holland over predetermined paths. Most arrived over their drop zones as planned but some suffered accidents or were shot down by the German aircraft or ground fire. We started from our base at Saltby in the English Midlands. Our airborne troops were members of the 4th Brigade of The British First Airborne Division, the Red Devils. The day before, we had delivered 1st Brigade without incident. We took off about 1100 hours, crossed the English coast at Aldeburgh near Yarmouth, and flew across the English channel to the Dutch Island of Overflakee (no kidding). From there we flew to our Initial Point (IP) at Wageningen before turning toward the drop zone near Ede which is west of Oosterbeek and Arnhem. It was there at 1400 hours that Merz was hit by German ground fire and crash-landed in a field between Wageningen and Rhenen. Several of us watched him go down, and since there was fire in the cockpit, none of us thought that anyone could possibly have survived. Now we know that Merz and co-pilot Haagensen crawled out of the top hatch and into the hands of the Dutch Underground. The navigator, Russell Stephens, and the radio operator, William Buckley, tried to bail out of the small door in front of the left prop and were killed instantly. Crew chief, Richard Eastman, was captured later by the Dutch SS and shot. If he hadn’t tried to surrender, if he had stayed with the two pilots, he might have gotten to a Dutch doctor. We never did determine if anybody knew what happened to Sgt. Yapel, a radio operator from another of our planes. He just never came back to us, and there was no official report. We just listed him as missing, presumed killed. Crew chief Desantis from the same plane told Merz that they both bailed out, but by that time, Desantis was by himself. We assumed later that Yapel was either shot or taken prisoner, but then one of our members reported seeing him after the war. One of the soldiers from my airplane was never accounted for. I suspect he was the one who came out with his tunic on fire. These guys were jumping out, and this guy came out on fire. I pushed him to the ground, rolled him around and patted out the fire. He stood up and I took his helmet off, even though they had darkened their faces with dark grease paint, he was singed. His eyebrows were singed and his face was singed. He knew it, and he decided he wanted to surrender. He walked across the field while the airplane was burning and the guys were standing around. He walked across the open field with his hands up towards a clump of trees toward one of the German anti-aircraft batteries. A couple of days later one of the Dutch Underground guys reported to me that a British soldier had been captured by the Germans, and they had a rope around his neck, and his face was burned, and they were marching him down the road to their headquarters. I wrote John Waddy and said this might be your missing Private. That’s all I can tell you. But this man just walked away and disappeared among the trees. He had to be the one who was missing. The only thing I can say is they may have shot him. These could have been the Dutch SS guys, and they, according to my Dutch friends, were the worst. It was worse for you to be captured by them than it was to be captured by Germans. I heard a discussion of this by my Dutch friends, and they hated their guts. There were two of them involved in the murder of Eastman. One of them was later killed, and I still have letters that were sent to me covering this. The other one was tried by a Dutch court for murder, and supposedly they were going to take care of him. But I learned more when I went back in 1972. The first time I went back, I looked them up and we were discussing these different things. I asked them, ‘What happened to the guy who shot Richard Eastman?” They called them MOFS, the traitors, and I got silence. Then Peter’s his wife, who spoke excellent English, said that he had been tried and convicted. Well, they said, they wanted to hang him or something like that, but he ended up with 20 years, and was out in 12. So much for that—and she said it made her feel bad they didn’t kill him, because he was a traitor, a member of the Dutch SS. Anyway, that’s the sequel to the Richard Eastman story. Yeah. These are the kind of things you find helpful. Talking to these people after all these long years, discussing again what happened. It wasn’t like a lot of people think—that all the Dutch were for us. Well, yeah, we flew over the first day, they were out there waving at us, but there were a lot of others who weren’t out there. There were those who didn’t want to get involved. Like the people who took in Eastman, supposedly to take care of him. And when Woody said he might have to be taken prisoner, they turned him out after Woody left. They turned him out; they didn’t want to get involved. Peter’s family was involved, and they wanted to be involved. They had a reason. Their mother was in a concentration camp. They had a Jewish couple hiding there before we got there. And the Germans took the mother because they felt the mother, in the story they told me, would be the most missed in the family. And she went to a concentration camp in Germany, the one that starts with an “R”. If you have read the book, “The Hiding Place,” well, it was that concentration camp. Dutch women from Amsterdam were sent there for hiding Jews. Well, some Dutch women survived this, but their mother didn’t make it. When we were there six years ago, the two sisters told me that they went to the site of this concentration camp and there was a big memorial plaque with the names of the Dutch women who had died there. Their mother’s name was on it. Those of us still in the air on 18 September flew on to drop our troops on the drop zone known as The Ginkel Heath near Ede. Then when all the troops were out of the airplane, we returned to our base in England by the quickest, easiest, and most evasive route possible. Merz and crew were left behind. None of us who came back that day knew anything about the evasion adventures recorded here until Merz and Haagensen were safely escorted out of Holland weeks later by the Dutch Underground. That story, the story of the successful evasion and return, is described in detail in the following pages. After their rescue and return to Saltby, Merz and Haagensen both wanted to get into an airplane and fly it more than almost anything else. This is typical behavior of dedicated pilots who enjoy their skills, so flights over England were arranged for them. And like all successful “evadees,” they were not allowed to fly missions again over the continent during the war. This was, of course, to protect those who had helped them escape, in case they were captured again and might be forced to reveal the names of their benefactors. One of their English trips was a flight to Liverpool where a giant warehouse had been set up to store the footlockers of all US forces listed as missing or killed in action. Merz describes this as a big gloomy barn of a place filled with sad news for the families of those tagged on all these footlockers. Both he and Haagensen were relieved to recover their lockers and be gone from there—and even in telling the story, George breathed a big sigh of relief. Eventually, both Merz and Haagensen were shipped home aboard a C-54 from Prestwick, Scotland. Haagensen sort of drifted away for awhile, but surfaced for the 61st TCS reunion list eventually. Merz served in various Air Force capacities, including another stint in Troop Carrier Headquarters at Stout Field, and then went on inactive status to complete an engineering degree at the University of Denver. He was called to active duty for Korea and stayed active until eventually he retired as a lieutenant colonel. He now lives with his wife, Ginny, in Dayton, Ohio. The recording was unexpected, and therefore not done under the best of circumstances. The camaraderie of the reunion took preference over the tapes, so there was no organized attempt to quiet the room. Both Merz and Johnston were members of the 61st Troop Carrier Squadron, 314th Troop Carrier Group, 52nd Troop Carrier Wing during this mission, and both participated in it on 18 September 1944. The events here originated from the second day, 18 September 1944, of Operation Market Garden. This was the ill-fated airborne invasion of Holland, and here are these two crew lineups as we have them. Merz and Haagensen were the only crewmembers that survived the mission. They were hidden by the Dutch underground and eventually joined up with 120 British paratroopers to escape through the German lines in an operation called Pegasus I.
Lew Johnston, your recording historian, also flew on this mission. 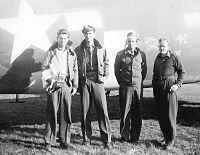 He was a citizen soldier without much interest in keeping wartime records, but here is a photo of his crew for this mission provided by a fellow squadron member. The overall history of Market Garden is well documented elsewhere, but the story of this successful evasion, with the participation of the Dutch Underground, will be new to many. GM We’re talking about Freddie Hale, and events during the 2nd day of the airborne invasion of Holland. That was on 18 September, 1944. JM Yes, he was on the one crew that we (The 62nd TCS) lost in Holland, the same day that George was shot down. They walked out almost together. GM Freddie was a Tail End Charlie. The 62nd was behind us and Hale was on the far right. Maybe he was on the inside of the flight. I’m not sure. JM I saw him get hit. I saw the airplane go down. Crew Chief Bell was telling me that he saw all of our airplanes at one time get shot down before his own airplane got hit. He was standing in the door. He saw the fire, he said, and he left. And a couple of guys got out but nine of them didn’t. LJ And you were telling him about? GM I was telling about how I got to know Freddie Hale. JM I had just made the remark that it’s amazing that only seven people from the 62nd were lost in the entire war—five officers and two enlisted men. GM You lost a few airplanes but they……. JM Yeah, that’s right; we had two enlisted men (a crew chief and a radio operator) on that flight. Hale’s flight. That was Harvey and Freddie Hale. And just before the plane crashed, Hale went through the top. The chute opened, and about the time the chute opened he hit the ground. He had his chute open and he said he swung about once and he was on the ground. LJ So he lived through it enough to tell you. He did live through it? JM Oh yeah, he walked out. GM When we went overseas, he was a co-pilot for a classmate. Remember Wikle? JM I was with him last December. He came to Little Rock. GM I’d like to see him. JM I had a picture of him with me last December in England—on my motorcycle. LJ Now, who is this you’re talking about? GM He was one of the 62nd first pilots when they went overseas. Hale was his co-pilot. That’s how I knew of him. The face was familiar to me, because I saw Freddie Hale. I didn’t know his name but I knew that he was flying with Wikle. And when I was hiding in Holland, the Dutch underground had a pretty good system. Boy, they knew who was where, and one day, one of the Dutch underground guys brought me a note with the name 1st Lt. Fred Hale, 62nd Sqdn. They had him, and they had told him that there were some other Americans hiding. I really didn’t know the connection, but I just kept that in mind. Fred Hale hiding someplace? I didn’t associate any face with the name Frederick Hale. So later when we were hiding in a farmhouse, Woody Haagensen and I, hiding in the farmhouse with a British paratrooper, we were joined by a fighter pilot by the name of George Sykes who had been shot down. He had heard that there were Americans hiding and he was alone and he wanted to join us. They brought him down to stay with us. After three weeks, Germans were coming in to occupy the farmhouse. Five officers were going to live in the house, and the 40 enlisted men were going to bivouac around the farm. That was Rest and Recuperation from the front on the Rhine, so we had to move. Bicycles were quickly produced, and while we pedaled down the driveway on one side of the house, the Germans had arrived and were standing at attention on the other side. LJ The Germans were right there with you? GM Yes. So we had to move. We went from the farmhouse without going into a lot of detail, we went from the farmhouse to another house about 3 kilometers away at a place called Rammerstein. It was a place where they had people who were mentally deficient. OK, a nuthouse in other words. And we lived up in the attic of this house, and the inmates had the first two floors. So I walked into the attic and that’s where I saw Desantis. He was already there, and I knew he was there because they told me they had this American Sergeant over there and I told you they waited him out for eight days when he was hiding in this old factory until he couldn’t move, because they said, he had a gun, and then when they did go in to get him he was half starved. Anyway, after we were there about three days, the Germans said they wanted the first floor of the asylum, so all the inmates had to move up to the second floor and the attic. We had a little room off to the side. There were Desantis, myself, Woody Haagensen, George Sykes, two Dutch policemen, and our British paratrooper. We were all in this attic. LJ Why were the Dutch policemen in there? GM They had been hiding from the Germans for some reason or other. LJ Where were they from? GM They were from that area around Rhenen—specifically where, I don’t know. LJ I didn’t know there were policemen there. GM I’ve got a picture with all of us in it. In the meantime the guys who had moved into the insane asylum were like quartermaster people. They were making a supply depot out of it downstairs, and that’s when I mentioned we were upstairs and we used to listen to them talking and singing, and there was one guy who had an American .45 pistol. And he was hammering on it, one of our .45’s. I couldn’t understand him in German, not to that extent, but he was muttering something. I think it was George Sykes who could understand German. He said: “what he’s saying, this gun is never going to kill any more Germans” or something like that. Beating it into the ground. I don’t know where he got the .5. Might have been the one that burned up in my airplane. But anyway, a couple of days later, the Germans gave the Dutch another order; they wanted everybody out of the house. They were taking over the whole house. They had to evacuate all of these inmates who eventually ended up in a barn somewhere up in the northern part of Holland. And the caretaker was working with the underground as well. So the way we did that, the morning they were moving, all the inmates were carrying their personal belongings and clothes and bedding had to be moved, and so they gave us each a laundry bag. I had like a jumpsuit on, you know, and they gave me a fedora hat to put on. That was mine, and the other guys were dressed similarly. We went out and we were in the line with the inmates and they had about eight nurses dressed in white and they were guiding all the inmates out and they were going down the stairs. The German soldiers were coming up the stairs, closer than I am to you, but what the German soldiers were doing is helping them carry their bedding out. LJ The irony of this! And we went to the back when everybody else was going out the front. So we got to the back, dropped everything we had, and there was a wooded area back there. Out into the woods went all of us who were hiding in there. And then they took us to a little house where a man and his wife lived out in the pine forest, sort of like a log cabin. And we had lunch with those people and they had an Irish Setter dog, and I always loved dogs, so I got friendly with the dog. And then we came under artillery fire from the British, and the shells were bursting all around. So they had a dugout in the back and we all ran for the dugout. One came very close. I remember the dog squatted right down at the first. Then that stopped. And then we came out, went back in the house, and pretty soon here came these people up the road on bicycles. It was our Dutch friends from the farmhouse that we’d left. Jana and Dickie and Peter and a Dutch man.. I always thought he looked like Nelson Eddy—big blond, he always rode on a bicycle, had a raincoat, and was always dressed up, tie, suit. I found out later that he was one of the leaders of the underground, and that he had been an industrialist, or he had something to do with the railroads in Holland. And so they said, go on back to the farmhouse. The Germans have left. Then so they had two bicycles, maybe three, or four. Anyway Woody, Desantis and the British paratrooper went back to the farmhouse on bicycles. OK. And George Sykes and I were left to walk, and one of the sisters, Dickie, the youngest sister was going to walk with us, and the rest of them went on bikes. Germans all over the place. Because we were getting into the area where there was a lot of the action. We walked across fields, along the roads and this girl walked with us and we all walked arm in arm. George Sykes on one side and I on the other side. And she kicked up a leg. We acted like we were just youngsters having a good time. And it worked. We walked right back to the farmhouse, three kilometers or whatever it was. And when we got back there, the father and the rest had cigars and wine to drink and were celebrating. We all had some Schnapps and some good cigars and they said that the Schnapps and cigars came from the German officers who stayed there. In gratitude they gave them Schnapps and cigars. Then they shared them with us, you know. And the next day they said they had orders from the Underground that they wanted pilots first. That’s the way it came out, Pilots First. So that meant George Sykes, Woody and I were to take part in this escape plan and that we had to go to Bennekom. So we again did the bicycle routine. They had the bicycles for us and we pedaled to Bennekom with Peter, the guy who came out to our airplane. Peter Jan Van Veldhoven leading the way and we went to Bennekom where he took us to a big house. Again, Germans all along the road, you know, and they nod, I had a corncob pipe I always put in my mouth, kind of look casual you know. But it’s amazing how this worked. Of course, it could have failed too if they had gotten wise, but we went to this big house and they took us in, and there was this older lady. She was sort of like the matriarch there and a lot of Dutch people around. They had something for us to drink and some cookies and Peter said Good-bye. And we chitchatted a little because some of them could speak English. Pretty soon, a man and a woman showed up and our hosts said: “OK, now, you’re going with them. I forget their names, and they’re going to take you to a hiding place, OK.” So we followed them as they go down the street and come to a grassy area where there’s a little dirt footpath. So they walked ahead of us, and we followed, the three of us. There were these young Germans, maybe in their late teens or early twenties on bicycles, sort of wobbling along. Then, when one of them came almost up to me, I stepped one way to avoid him, and he turned the other way to avoid me—and lost his balance and fell off. Neither of us said a word, and I kept walking. That was about as close as I ever wanted to get to one of those guys too; we were right there in he middle of them. We got to the cemetery, and there we went in and we met the caretaker. It was one of those places where it had the caretaker’s house on one side, and a tool room and shed on the other side, with big archway over it. This was the Bennekom-Wageningen Cemetery, and when we went in, the caretaker had a big logbook. He had this logbook of all the people he had just buried, and they were buried a couple of weeks then. And he said they came out of one airplane. OK. I looked up the list and I recognized three Americans there and the rest of them were British. I could tell by the ranks. One of the Americans was a 2nd Lieutenant. Well, I’ll remember that name. It was easy. I called him Harvey Thadeus because they got it off his dogtag, apparently, his last name first. So Harvey Thadeus, 2nd Lieutenant. And then later after we were at the cemetery for about a week, the Germans ordered an evacuation l5 miles back because they expected the British to push over the river. I think they wanted everybody out of that area, l5 kilometers back. And even the people who ran the cemetery had to leave. They loaded up on a horse drawn wagon with all their personal belongings. They were heading north. Well, what does that do for us? There are four of us hiding, British warrant officer, and George Sykes and Woody and I. Next thing, here comes a Red Cross lady and a young girl with bicycles. Only two, each one of them had a bike. So the way they worked this was that George Sykes and Woody were going to go first. And they told us that we should follow the persons on the bicycles, just keep walking and keep walking. If they stopped it was so we could catch up. So they followed the young girl, and then the British guy and I had to follow next. And we followed the older lady who had the Red Cross garb on like they wore over there with the capes and all. So she pedaled, and this British guy and I followed along. There were some Germans off on the side of the field. There had been some P-51’s flying over and doing some air/ground support work or something. These guys were out there fiddling around the bushes. Might have been a half a dozen of them. She stops to talk to them. We got a little shaky about that time. She’s talking German. Then when she saw that we were getting close, she stepped on her bicycle and started down the road again. So we had to walk by them. They had given us armbands so that we were supposed to be aiding in the evacuation, so we could walk towards the river when everybody was supposed to be going the other way. So we just walked by these guys. I can remember one of them was looking at us. He was an older German. I think he was the Sergeant or something in charge of the group. He just looked at us. We kept walking and ignored them and kept walking. We saw a German driving our jeep that they had captured. Then we saw ambulances going toward the river appearing to be empty and returning with men bandaged up. I found out later that they were British guys taking men to the rendezvous area for the escape, with several men masquerading as wounded for the next load to be taken in. Thus making the Germans think they were evacuating wounded from the fiver front. Then we saw a bunch of young German soldiers assaulting a house. Well, it was a training area, we found out later. And that’s what they were doing. They were learning how to do it. Attack. So then we reached a point in the road where the older lady we were following stopped. And she motioned us to come on up to her. At the same time, here comes the young girl with her bicycle. Then the Englishman got on the bike to pedal and the young girl got on the back. And then the older lady told me to guide and pedal and she got on the back. And we were pedaling down the road. I always remember that British remark. Everything was jovial. And so then they said we’ve got to go across the road and we went across the road and down the hill and here in this grove of pines were guys all around, laying around. Some of them had their arms and equipment; some of them didn’t. And OK, this is where we’re going to spend the next night and the nights after that, until we were going to leave. And then I spotted this guy who looked very familiar to me. He was already in there, and there was another American in there who was a P-51 pilot who been shot down. This was 1st Lt. Clyde Voss. And there was this other guy. I said, “Hey, I know you.” He says yeah. I said, “Who are you.” And he said, “I’m Freddie Hale.” “So, you’re Freddie Hale.” And that’s how we initially met. So I asked him if he knew anybody by the name of Harvey Thadius. He said he didn’t, but he knew Thadeus Harvey, who was his copilot. So I told him what had happened, that I found him in the cemetery with all those guys. It was kind of tough for him to believe that because he thought they all bailed out. He swore up and down. He said, “I told them to bail out.” He bailed out the last minute and the parachute just about opened after he went out. He hit the vertical stabilizer. The parachute opened and he was on the ground. That quick. LJ So this is a collection point for you, where you were with all these guys. GM Then we came out with the Pegasus One operation. Well, it’s all in that book that I have. The one from John Waddy that I showed you. I’ll show you some of that which shows how we made Pegasus One. What it amounted to, we stayed there out in the woods the first night and they carried some food into us. The Dutch provided it for us, I guess. Something to snack on. And our toilet was out in the woods. That’s all it could be with 120 guys. You had to be careful where you stepped. Also on the first night, while we were staying in there, we had to sweat out, not German fire, but British. They were lobbing mortar shells over. The mortars were landing close to where we were hiding and it became like a game. You’d count them. I remember going up to about eighteen, and then you had to sweat out eighteen explosions. The following night on October 22 at 9 o’clock, we were going out. The plan was that on the other side of the river, the British Army, with some of the 101st Airborne Division in the front lines with them, were going to assist in our crossing the river—but first we had to get through the German lines. So everybody blacked up his face. They had burnt cork. Put the cork on the face, you know. No reflections. We all got in a single file with the Americans and the Canadians, Tail End Charlies. We were the last ones. The rest were all the British. They had all the weapons there were at the front of the line. They didn’t have many, a couple of Sten guns, and a few pistols. Not all that much for a hundred and twenty guys. So then we went marching off through woods that had been scouted by a British SAS Captain King (Terrific guy), and the Dutch underground. So here we go tramping through leaves. I’d swear you could hear us a mile away. We were in there where Germans were dispersed in the area keeping the British from crossing the river. LJ But you got across the river at any rate? GM Well, here’s what they told us. We were going to take three hours to get to the river. We were supposed to get to the river by midnight, starting out at nine o’clock. And that Brigadier Gerald Lathbury was up front, dressed like a private, leading us. His staff had a flashlight that flashed red, and they were to flash it at the other side when we got to the river. We were to be guided by a stream of tracers—and then light balls (tracers) from the other side were to be used to guide us. A Bofers gun would fire from the opposite shore at midnight. They would fire a stream of tracers at the point on the shore where they wanted us to be. If we got there OK, we were to look for the boats—and if we messed up, we had the choice of swimming, or being captured and possibly shot. LJ You were just a river away from freedom. GM So then we traversed those three miles and we had a couple of crucial points. One, we had to get by an open field that was covered by German machine gun fire. They were stationed there and they could just open up if anybody came across there. We had to go across that field and the way they did that; I forget exactly what the distance was, but it took over an hour to get the 120 guys across that field. The way they worked it was that we went like spiders on our bellies; we crawled across. And we could hear those German guys who were at the machine gun. We could hear then talking, and they weren’t expecting anything. Magnesium flares would light up the field occasionally because they were coming from the other side. And they took ten guys at a crack and then one came back. And ten more and one came back. These were British guys doing this, they were doing the leading. Back and forth until we got all 120 guys across that field, crawling. Without any Jerries knowing about it. That was the longest part. Crossing that field. And then after we got across the field, we got to the road that parallels the river. There’s a highway on the North side of the Rhine that just parallels it. Runs right along the river. And so, it was up on the dike. Like in Holland. So here’s a bank on this side, and a bank on the other side. Then we’re down in the river bottom and this was our last stretch to go down. So they lined everybody along on the North side of the road, and then one man checked the highway, one man on one end and another man on the other end because it was a long stretch. And then on the signal everybody went zip over the road. 120 guys went over the road just like that. We all crossed at the same time, and then got in line again. We were down in the river bottom area in there. There was a factory there, I remember, that we had to go by. The guys at the front of the line ran into some German patrol. And there was some shooting going on at the front. They killed a German and the rest of them took off. It was a small patrol, about six guys or something like that. And so, we were just about at the riverbank and we were all huddled there and they flashed the red light and nothing was happening. And next thing we heard, mortars coming; these were German mortars this time. Everybody moved out of that area and we moved on down farther. Still waited, waited, and then at midnight came the tracers from the Bofers. And that was the first time that we knew that they knew somebody was coming through. We weren’t getting a fairy tale. And they fired the Bofers right at midnight. Here come those tracers. And so we waited a little longer, and someone came up the river. It was a Canadian who spoke American English. That was the Canadian Second Army in there too and he apologized for the boats being late. They were down the river, to follow him and that they had a line of 101st paratroopers, that’s what they were, that were fanned out to cover this place where the boats were going to land, where we could all get in the boats to cross the river. When we went across, everybody was happy. Then they made us carry the boats. These were not the light ones; they were heavy wooden assault craft and we had to stay on the tape line—follow the tapes. It was mined all around there. White reflective tapes on the ground. We carried the boats out and then the next thing, I ran into a paratrooper, one of our guys and he gave me a can of Players cigarettes. And I got chit-chatting with him and I said, “Hey, how come we had to wait so long for those boats?” And he said they had heard three days before that a bunch of guys were coming through but the British Commander didn’t think that you were going to make it and he didn’t want to commit his boats unless he knew you were really through. LJ So he waited until he found out? GM Yeah. The Pickup on the Freddie Hale story. When we were on the other side, we learned that when the Germans fired their artillery, they fired always for effect. Fire at 6 o’clock in the evening, and fire at midnight. They’d fire for about half an hour every day. On the British side, it was harassing fire. All day long. And when we got on the other side, then came the German barrage when we were crossing the river. It was going on then. Then they put us in trucks and jeeps. They took the officers in jeeps and they put all the other guys in lorries, and they took us to a field kitchen where we had tea and a shot of scotch. Then got into lorries again to go to a hospital in Nijmegen. On the way to the field kitchen, a guy we would get to know much later at our reunions, Tony Hibbert, was leading us. He was a British Major then, and he was riding on the hood of our jeep that ran into the back of another jeep in the hurry to get away from some shelling. LJ So this is near Nijmegen? GM Yeah, in between Nijmegen and where we made our escape at a place called Renkum in Holland. And then they took us to a hospital at Nijmegen where they had had a lot of wounded in there in the battle, in the fighting. Like I was telling him, it was kind of smelly. They had rooms full of bandages, used bandages and that sort of thing. And they gave us more scotch and put us to bed. And then we all woke up late the next day, we were addressed by Brigadier Gerald Lathbury (who came through dressed as a Private) that we would be going to Belgium and England, and that we would be interrogated there. Mum’s the word and that sort of thing. George Sykes and I (Sykes was the other Captain) got our heads together about then, and decided that since he was British, we could go our own ways and report to the American 101st Airborne headquarters close by. We discussed this with the other guys and we all agreed. There was one Canadian there and we asked him if he’d like to join us. He said, he’d like to but couldn’t because he was under the control of the British. And so the next morning (Freddie Hale was with us) we went out at 6 o’clock in the morning. We agreed that at 6 o’clock we were going to wake every body up and sneak out. And that’s exactly what we did. Everybody is sleeping, and we woke up the other guys. One of us woke up first and then woke up the others. Either Sykes or I. Anyway, we all got up, sneaked out of the hospital. We sneaked very quietly, tiptoed out into the streets, and we saw a lot of white crosses along the road from our guys who’d been killed from the airborne, the 82nd I guess, 101st was not in there during the early fighting, and we stopped one of the locals. It was early in the morning and we found this young Dutchman out on the road who could speak English. We asked where the American headquarters was. He told us. He gave us directions. It wasn’t far away. And so we hike over there. There was a guard there. It was like a big palace they had taken over big building, it was fancy. We told the guard who we were, where we’d come from. That we wanted to talk to whoever was in command there. LJ Let’s stop and we’ll get back to this. GM We were up at 101st headquarters and we explained to the guard who we were, where we came from, and that we just left the Nijmegen hospital. We were reporting into the American headquarters, 101st Division. He understood, so we asked to report to the commander, so he got on the horn. This Lieutenant Colonel came down, Lieutenant Colonel Stewart, I guess he was a Battalion Commander of the 101st and George Sykes, our fighter pilot, one of our fighter pilots, was a West Pointer. He graduated from the Academy, and he had his ring on. And Colonel Stewart, who came down also had an Academy Ring on. Sykes was one of these people who jumps at opportunity, so his first remark was, ‘So, you went to the Academy.” They compared rings and class so Colonel Stewart took us under his wing, and we went in and met the whole command staff, and met the guy who was commander of the artillery, who was harassing us. We had breakfast with them, and then they set us up to get on a convoy that was heading for Tilberg in Holland, going towards Brussels. The next day at Tilberg, a convoy was going from there to Brussels, to the airfield at Brussels, B-53 or whatever was down there. So each of us, there were five of us, got in a different truck with a driver. Convoy starts off, and Woody Haagensen and Sykes and this other P-51 pilot, Clyde Voss, were in trucks that were in the front and Hale and I were in the back trucks. And we had these quartermaster drivers; the one I was with was a real nice guy. We had nice conversations. The weather got bad and he got lost. And here we are somewhere in Holland, and you couldn’t even read the signs on the road. So I said, “Why don’t we just park this thing and wait until daylight comes, and get a little sleep and then proceed. So we parked. He had blankets so we slept for about three hours. So we did just that, and a lorry stopped. We jumped into the back and went on to Brussels. When we got to Brussels, the other guys had just left. There were some of our people from the 61st glider pilots. I remember John Verbosky was there. He was a good pal of mine, and I asked him, “Did we have anything going back.” And he said we just missed an airplane. Woody Haagensen and the other guys got on a C-47 that was taking them back to their bases in England. LJ That was Doversburger and me. LJ Yes, we had flown a wheel to Brussels for one of our airplanes that had a flat tire, and we were waiting to fly back in the morning. That evening, we were enjoying some of that light Belgian Lager in a downtown bistro, and we saw them walking into the front door. Doversburger says “Look” and there’s Haagensen and whoever it was. We took them back in the morning..
GM How about the two fighter pilots. LJ I don’t know. Maybe so. GM I know they got back to their bases too. OK. Well anyway, Freddie Hale and I are there and there’s nothing to take us back. There was a C-47 from the 313th there. So I went and checked and I happened to know the co-pilot, guy by the name of Fick. I told him what had happened to us, and e said, “Well we can take you back but we’re going back to Eindhoven to do something. Then we’re going to Rouen, a little French town over there.” So I said, “What the heck,” and we got on the airplane and went back to Holland, and then over to France to Rouen. Of course we didn’t have any shaving equipment or anything. We were just a couple of bums—and so then from France the pilot said he had to stop at RAF Manston for some reason, so off we went to Manston. And when he went into operations at Manston, he mentioned something to the British operations there that he had a couple of “evadees” from the continent that he was taking back to their home base. That was an upset. British MP’s came out and arrested Freddie Hale and Me. Put us under arrest. Took us off the airplane and then they took us to some British Colonel, an army colonel who I guess was an intelligence type, and he interrogated us. It might have taken about 15 to 30 minutes before he was convinced that we weren’t a couple of Germans who just came over to the continent acting like “evadees”. Of course, the other guys didn’t go through that. They went right back to Saltby. We finally convinced the Colonel that we were not frauds—that we were the real thing—and so then he had some of the guys take us over to the American MP detachment. There was a Major in command of that. And he got us a place to stay, and he got us passes to go to the RAF Officer’s Club. We went over there. All these RAF guys got attached right away to us, they wanted to hear our stories. And they were all buying us drinks and we both got crocked. And we had a good time at the RAF Club, and then we went to bed. The next morning, this major had us set up with a command car and a driver to take us to Widewing in London, which was a big intelligence center. There we were able to get paid and they did a whole bunch of things for us there. And then we were billeted at 63 Brook Street in London, which was a brownstone building. It is still there, 63 Brook St. That was the place where all of the “evadees” or “escapees” who came back from the continent were steered to. They put you up and you stayed there and wrote the details of what happened to you. LJ So you wrote all this down. GM A lot of it. Yeah. They gave us a desk in a corner and they gave us passes to be able to go into London out of uniform until we were able to buy some uniform items so we would look presentable. But we were allowed to go wearing field jackets, no hats, and that sort of thing. You had the pass in case MPs stopped you. That was temporary of course. And then they had nice accommodations. Downstairs they had refrigerator full of all goodies. If you feel like having a snack just go down and help yourself. But start writing. Whenever you have some time, write and write until you complete your story. We didn’t have to do it all at one time, and then when we were finished, they wanted names of people who had helped us, and that sort of thing. I remember asking the briefing officer, he was an Intelligence Captain, and he said we want the names of everybody who helped you. He said it’d be strictly confidential. Those names will not be released. They’d be classified. But we want them so we know who the people are who were helping our “evadees” and “escapees” over in Europe. So they can get the recognition they deserve after the war. And so we did all that. When we finished, they gave us a ride out to Northolt and said, you can call your base and get transportation. So we went to Northolt. I called Col George Falkner, and told him where we were. He said we’ll have an airplane down right away, in hour and a half, a C-47 came in and took us back. I forget who the pilot was. I don’t think it was a 61st airplane. LJ Boy, that’s quite a story. And you’ve been back several times. And you’ve had them here? GM Absolutely, I went back 28 years later and I was in Germany and I rented a car at Ramstein and drove up to Holland to the Esso motor Hotel right outside of Arnhem. And I got a phone book and I looked through and I found the name of Peter Jan Van Veldhoven. That’s the guy who came out to the airplane and rescued us. Probably saved our necks or we might have been shot too like Eastman was shot. So I called this number in Rhenen, and a young girl answered in Dutch, and I told her that I was George No. 1. There is a story in this. Woody and I were the first ones there; a fighter pilot named George Sykes followed us. He had been hiding in upper Holland, I think near Utrecht, with some Dutch Underground, and while he was there, they assaulted some Germans in a barn, and killed about six of them, and he had to help bury them. He said he wanted to get away from that crowd, and when he found out there were other Americans in hiding, he asked to be brought to us—and so he was. He was then known as George 2. There was a hesitation on the phone; then she came back at me in English. She said, “Oh, George No. 1, I have heard of you from my father,” and she said my parents are gone. They are at Leyden in West Holland but I will call them and they will want to see you.” So she called, and she called me back at the hotel, and said that they will be there tomorrow, and will I be there at 10 o’clock in the morning. I said I’d be there. So the next morning we drove over to Rhenen, which was about 20 kilometers from Arnhem. And there was Peter right out there waiting for me. That was our reunion. And then we spent a couple of days there and later they came to the United States and spent two weeks with us. And then we went back again and again. Then we went back on the 40th D-Day reunion they joined us in Amsterdam, and then they went with us out to the where the airdrops had taken place. GM Addressing Gordon Trendel “You were there. That’s where I first met you. Remember I asked if there was anyone else in the 61st there. It was 62nd event, but there were people from the 61st, the 32nd, and the 50th. That was a pretty good trip. Then we got on the bus, went out to the Ginkel Heath, the landing area. You remember my Dutch friends. When I got on the bus, they were crying. We went back three months later with the British to their 40th reunion at Arnhem, and we were with our Dutch friends again. That was the last time we saw them. First his son in law, who was 38, had a heart attack and passed away. Then he was with the two young Dutch people. He died about a year later. He worked for NCR and he was one of these guys who was a driver. You know, always pushing and he was moving up the ladder and he had a heart attack. Keeled over. And then the mother passed away couple of years later. And then we went back for the 50th reunion and this was for the Pegasus Group. I was invited by my British friend, and I got to know a bunch of those guys. Especially through, the guy who jumped out of my airplane, he was a retired four star general. LJ You gave me something of his, a write-up or something. GM Yes, I did. That was written up on him when he was at Arnhem, one of the celebrations there; General King was his name. He passed away about 2 years ago. But then when I went back to the 50th reunion. Ginny wrote a letter to Peter’s daughter, and told her that we were coming and I wanted to see her father. And when we got over there we got to this hotel that the British got us set up in, where all their guys were staying. And had a phone call from this woman, Fhea was her name. She said her father passed away the year before, so here we are, full circle. That’s the way it is, I guess, and he was a few years older than we were. His sisters were our age. She said she was coming to see us the next day. She drove all the way from the Zieder Zee down, a pretty good drive, and so she spent the day with us. And the next day, we had a reunion with the two sisters. They were the girls I took the pictures of, Jana and Dickie. And we had our reunion exactly 50 years to the day from the time that we met. The way we met was when Woody and I and our paratrooper walked into their farmhouse—three strangers cut and bleeding—they took us in and took care of us. The older girl, Jana I remember, came with a little pan of hot water and she was talking away in Dutch as she washed my face and washed my legs where I bruised them. Then she called the doctor—an underground Red Cross doctor who was working with Germans and working with the Dutch. That’s how I got the information on who was killed when he brought me the personal effects to look at. And I asked him then what was going to happen. He got them from the Germans. And he said that they would be packaged and sent back to the United States to the dependents left behind. LJ The Germans let him have them? GM Yeah, because they were the ones who picked up the bodies. LJ That’s a story. That’s a story. I’ll treat it well and transcribe it. GM I was invited to go back last year to the 55th reunion by this Tony Hibbert who was a British major at the time. He was one of the guys who did a lot of arranging for our escape when the final 120 of us got away. He invited me to come back last year, the 55th, but I had just had that heart surgery and I decided I didn’t want to chance it. I called Tony Hibbert, and he sent a nice letter and sent me another book that was written on the Battle of Arnhem—not the one that I showed you. LJ I want to get the title of that. GM And he said they all had a drink for me and I’m waiting to hear again. Usually I get a letter inviting me to their dinner every spring in London at the Army Navy Club. This is a gathering of the officers of the 4th Parachute Brigade, and General Hackett was the commander of that. He was a little short guy. You’ve heard of him, I’m sure. I met him, of course, at the dinner for Major General King. The rest of them were Colonels, Lieutenant Colonels. Some of them, of course, left the service after the war. They were a close-knit bunch, but they’re losing them too. The secretary is a guy by the name of Jasper Booty, who was a staff officer. And he writes a letter every year after they have the meeting and summarizes what went on and who was there and who sent their regrets and keeps everybody advised who’s passed on, and that sort of thing. So now, they’ve opened it up to sons, nephews, to get the feel. LJ Bob Cloer and I went over to the celebration in Arnhem one year. GM It wasn’t the 50th or 55th; it was one of the years in between, wasn’t it. Because at Arnhem, they have a reunion every year. Every year they have a reunion and they get a mob, the whole remains of the division. They parade across the bridge. They go to the cemetery, big deal there but then this escape group, this Pegasus l group I was talking about run by Tony Hibbert who was from the 1st Brigade. And that was another thing, when I was invited over to the dinner the first time with General King. He knew that I came out of Pegasus l and I mentioned Tony Hibbert in my letter. And so he wrote and told me, after I told him that I was coming, he said I’d like to tell you that a friend of yours is also invited to the dinner although he isn’t from our Brigade, and that was Tony Hibbert. He came as a guest. The British are something else, I tell you. I am overwhelmed by the treatment. LJ Who is the other historian in Holland? You gave me a name. GM The Historian. I haven’t written him in a couple of years. I guess he got tired of me. His name is Joop Siepermann. Pronounced Yope, not Joop. I talked to him on the telephone the first time he called me. I think it was a call after I got a letter from him. And I referred to him as “Yope”, and he said, ” Oh, you know how to pronounce my name. All those Englishmen call me “Joop”. LJ I wondered how to pronounce that. GM They pronounce double o’s like “o”, like we pronounce an “o”. Oosterbeeck has two o’s. And it’s two e’s also and they pronounce two e’s like we pronounce a single e. There was a big battle at Oosterbeeck—also outside of Arnhem. LJ I heard from someone about this yearly celebration this year that they didn’t do the march. The march was too much. GM Well, they were all like us. LJ Bob Cloer and I thought about going over this year, and maybe we’ll try it next year. GM I’d like to go back, and Tony Hibbert was having these other things every five years, and we had one in 1994 when I went back for the second time…that was his invitation for Pegasus. They combined it with the big show too. LJ I tell you of one little tiny follow-up. In San Francisco about a year ago, I was standing by my car and a couple with a youngster walked by. I have this Troop Carrier thing on the back window, and they stopped and asked about it. To make a long story short, they were visiting from Holland and they lived on the edge of the Ginkel Heath. I told them a little bit about what we’d done there. GM Most of those people there, even the ones who weren’t born yet, know about it. LJ When we were over there, we went up to Amsterdam, and I got run over by a bicycle—a bicycle hit me and knocked me down, broke my ribs, You know, a big heavy Dutch bicycle right downtown Amsterdam and he knocked me down, and they put me in the hospital. The Dutch people followed through. I had insurance. I said you know I have to pay for this with insurance and I can’t pay you right now. They said OK. But the insurance company balked, didn’t give me the money for a long time. It took a long time before they came after me for money—and somebody who knew the story said, “Tell them why you were there.” I wrote a letter to the collector and said, “I’m working on this. I’m going to get some money, but I want you to know why I was there. And I told them I was one of the pilots who dropped the troops. That was the last I heard. They just waited patiently until the insurance company paid me, and I sent it to them. GM You know, talking about the bicycles, I can remember being in Amsterdam. The first time we went to Amsterdam, Ginny and I went up there, that’s the first time I met my friend after 28 years and then we went on to Amsterdam. And I can remember the bicycles and the cars were all lined up at the stoplights. And as soon as the light turned green, bicycles, motorcycles, cars went every which way. LJ They arrested this guy, because he was in an area he wasn’t supposed to be in. I got paid by the insurance company here and I didn’t press it. I let it go. I don’t know what they did to him. But they were unhappy that he did that. Well, I’m going transcribe this and send a copy to Jan Bos. I think he will appreciate this. GM He may know Joop Seipperman, who let me know that although he had a German name, he was Dutch. I said, “Hey I have a German name too”. Since 1980 I do research about airplanes wich came down around Wageningen, so also about the C-47 of Frederick N Hale and Thaddeus Craig Harvey. If you are interested in the story which was written just after the war by Col. Th. A. Boeree, please let me know. Thank you so much for recording and publishing this. I am John Thaddeus Harvey, the nephew of Thaddeus Craig Harvey (called Craig by the family since his father was also Thaddeus Harvey), who was the 2nd Lt from the 62/314 mentioned in the story, and Fred Hale’s co-pilot, who was killed on 18 September 1944. I never met him, being born 16 years later. My daughter found this article recently on the web as we were researching to write the obituary for my father, Craig’s only sibling, who was 13 when he was killed (Craig was 20, born March 1924). My father never read this, and never knew exactly how his brother was killed. I am now going through boxes my father gave me with my grandfather’s letters, and letters from the Army Air Force tell me that Craig’s grave in Waginengen was not known to the Graves Dept and he was not positively identified until 1946. His remains were disinterred around 1950 and he is now buried in liege, Belgium. It is incredible to me the luck that Craig was to be only one of seven people killed from the entire unit, on his first combat mission, and at the same time consider the profound effect his death had on my grandparents and father, and some of the spillover onto their descendants. Craig’s cousin and best friend, McConnell Roger Harvey, survived more than 30 missions as a B-17 co-pilot flying missions all over Europe and died at 92 two years ago. Thank you for providing this insight into what happened. And thanks to all who served. Thanks, we’ve made the edit. It’s nice to hear from you!